In 2011 we won an award for Best New Community Project. Join genealogists worldwide (and our relatives and friends) who have found a simple way to make a big difference. We enable people without access to traditional banks (including many women) to expand their businesses, educate their children, save for the future and raise themselves out of poverty. Through Kiva, a non-profit organisation working with microfinance institutions, you choose a borrower to support with a loan of just $25. Similar loans by other lenders are combined until the required total is reached. As your money is repaid you can withdraw it or lend it to someone else. Money that is loaned over and over again does more good than a one-time donation. Join 'Genealogists for Families' - together we are making a difference! Mnatsakan is a young entrepreneur who has a bakery where he makes lavash, an Armenian national bread. 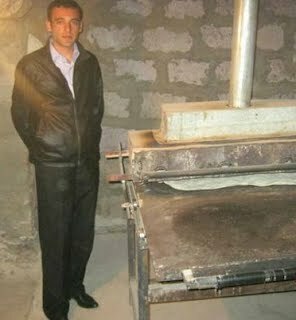 He needs investments to develop the bakery by buying special equipment to puddle the paste and flour to make lavash. This will allow him to expand his production and increase his sales, generating more income and creating improved living conditions for his family. The funds he needs must be received by Kiva (as $25 loans by people like you and me) within the next three days. The 'Genealogists for Families' team is responding to this urgent call. There is still a long way to go; so if you can help this hard working young man with a loan of just $25, please see www.kiva.org/lend/420519. Update, 2 Jun 2012: The response to this was amazing. The loan was fully funded before the deadline, and 24 of the 57 lenders were Genealogists for Families members! Many enthusiastic people followed the loan's progress and commented via the team's Facebook page. Mark said, "Well done to the GFF team. I think this is what Kiva is all about. Lots of people getting together to make a real difference. I hope that lavash is good! There are a whole lot of people here with a little stake in this bakery." Another borrower who needs more support is Gulchehra, who does beautiful gold embroidery. She has four children, and needs a loan to purchase plastic windows and other things to fix her house. It's great to see that many 'Genealogists for Families' team members have already responded to the call. The deadline is fast approaching, and I will be so disappointed if this loan is not funded. Even if you cannot personally make a $25 loan to Mnatsakan, please spread the word. This is where social networking is very effective! The link is www.kiva.org/lend/420519. The response to this was amazing, with a lot of enthusiastic people following the loan's progress and commenting via the team's Facebook page. The loan was fully funded, and 24 of the 57 lenders were Genealogists for Families members! Mark said, "Well done to the GFF team. I think this is what Kiva is all about. Lots of people getting together to make a real difference. I hope that lavash is good! There are a whole lot of people here with a little stake in this bakery." If you are trying to chose another borrower, have a look at one of mine whose loan needs to be funded within a week or so. Gulchehra, www.kiva.org/lend/425549, does beautiful gold embroidery. She needs a loan to purchase plastic windows and other things to fix her house.